Michel Dalberto has rightly achieved a reputation as one of the leading French pianists of his generation, despite a reserved style and penchant for less flashy repertory. 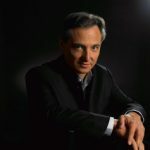 In fact, Dalberto is known for his Mozart and Schubert, and while he plays Liszt, Schumann, Debussy, Ravel, and other composers associated with more challenging works, he has generally avoided the virtuosic side of their music. Perhaps Dalberto’s greatest accomplishment to date was his recorded cycle of the complete piano works of Schubert, captured on a 14-CD set for the Denon label. Dalberto has also appeared in concert and on recordings as accompanist to singers like Jessye Norman and Barbara Hendricks, and as a collaborator in various chamber works, especially for violin and piano. He has made numerous recordings for a variety of major labels over the years, including Denon, EMI, BMG/RCA, Harmonia Mundi, and Erato. Dalberto was born on June 2, 1955, in Paris, France. His family was nonmusical, but young Michel began playing the piano before his fourth birthday. At age 12 he was studying with Vlado Perlemuter at the Paris Conservatory. Later teachers included Nikita Magaloff and Jean Hubeau. In 1975 Dalberto won the Clara Haskil Competition and three years later the Leeds Competition, where he played a Mozart concerto in the final round, the only first-prize winner ever to do so. Debuts in major European cities soon followed, including Paris, Montreal, Amsterdam, Vienna, Frankfurt, and Rome. His first recordings were also making a splash: on the Erato label discs of Beethoven sonatas (1980), Mozart concertos (1981), and Chausson songs with Jessye Norman (1983), appeared to generally favorable critical response. From 1988-1995 Dalberto recorded all the piano music of Schubert, one of the few pianists to have taken on this challenge. In 1991 he began serving as chairman of the jury at the Clara Haskil Competition in Vevey, Switzerland. Dalberto signed a contract with BMG in 1997 and his first recording for the label, Debussy’s Images and Preludes (Book I) — released on RCA, achieved wide critical acclaim. In the new century Dalberto remained busy on the concert and recording scenes. His 2005-2006 concert schedule was brimming with engagements throughout Italy, France, England, Russia, and the U.S., including many appearances with major orchestras. His recordings include a 2004 RCA release of Liszt paraphrases on operatic sources from Wagner and Verdi.